New Poll: 48% of New Yorkers Support a New 9/11 Investigation into Building 7's Collapse. As the 10 Anniversary of the 9/11 attacks approaches quickly, a new Siena poll shows that half of New Yorkers today are in support of a new probe into the collapse of World Trade Center Building 7. The poll shows that 1 in 3 New Yorkers were unaware of Building 7's collapse, and despite the importance of the events of that day, only 25% have ever seen video footage of Building 7's collapse. Only 30% could identifty the name of the skyscraper. Moreover, the poll shows that only 40% of New Yorkers believe the official explanation that office fires were responsible for the collapse of this 47 story steel-framed structure. Public Access TV is a great way to reach a lot of people. If anyone is interested in getting "Blueprint" aired on their local public access TV channel(s), it can sometimes be as easy as filling out a simple online form if you are a local resident. Please report any airings to the team! We are pleased to announce that today from 1 to 2pm EST, Manny Badillo and Tony Szamboti of the Remember Building 7 campaign will be on the Colin McEnroe show on WNPR, National Public Radio’s Connecticut affiliate. They will be joined by Cheryl Curtis and JoAnne Bauer of Connecticut 9/11 Truth, who helped organize the recent Investigate Building 7 conference at the University of Hartford. Be sure to tune in if you can, and please forward this announcement to anyone who may be interested! Today I was given two hours of "advance notice" regarding DOJ's decision to not prosecute the remaining alleged 9/11 conspirators in an open court of law. According to DOJ's statement, the remaining individuals will be sent to military tribunals. I recognize that there are many, many other things for Americans to be upset with today, but I hope everyone can take a second to contemplate this decision and recognize what it says about President Obama, the Department of Justice, and the United States. 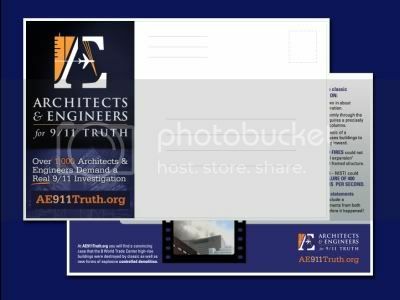 January Action: AE911Truth Action Group -- Mail postcards to architects and engineers in your community. These effective postcards give the crux of the controlled demolition evidence for Building 7. One side is the front of our WTC 7 Evidence Card and the other side has room for a mailing address and a postage stamp. A convenient way to get the evidence out to every architect and engineer in your community and everybody else that you know without having to be there in person. Just open your Yellow Pages to get the addresses of A/E's, then put on a 28-cent stamp and drop in the mail! Just in time for Christmas. Shelton and the rest of the 4409 crew have struck again... Here's their second 9/11 truth billboard promoting AE911Truth! This is set to be another youtube sensation. 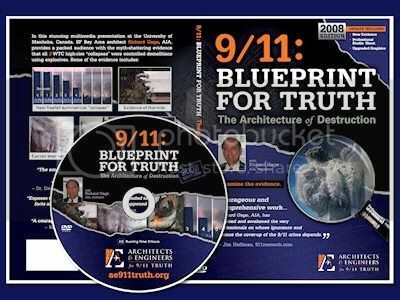 Total Facebook Friends of Architects and Engineers for 9/11 Truth has now topped 20,000, having doubled in the last two months from 10,000 in early August. Combined with World for 9/11 Truth's 19,400 Fans, we are looking at a total of almost 40,000 friends of 9/11 Truth! Even with the obvious overlap, this is still an impressive figure. The social networking phenomenon is alive and well and doing its part to spread the message of the most important movement of all-- OURS. Tremendous credit to JF Ranger for updating the Facebook pages on an almost daily basis with the top news stories and action campaigns. The system is oiled and producing results. Friend Us! *Please submit the following letter to your local newspaper on behalf of Bob McIlvaine and other family members who demand 9/11 truth and justice. Select one of the two versions below depending on the word limit requirements of your paper's public forum. (If 300 words, use the first letter--- if 200 words, use the second letter). NOTHING to write. Just mail this LTE along with your contact information or submit online at your newspaper's website. Let's set a goal of 100 submissions. They will ALL be read by newspaper editors and many will be published. Together we can reach millions of readers while promoting Building 7 awareness and activism. Do it for Bob! This letter is written in honor of those who died on September 11, 2001, and in support of their families who are still seeking the truth about that day, including Bob McIlvaine, who lost his 26-year old son, Bobby. Click to visit the temporary website! Thank you for helping us meet our target for the first week of the “BuildingWhat?” fundraising drive! We have $10,547 in the bank to air TV ads showing footage of Building 7 all over New York City. After expenses that’s enough to reach 100,000 people with 10 spots. Who wants to see enough raised for 500 spots? Every $750 we raise is enough for another spot to reach another 10,000 people, so please contribute generously and ask your friends to contribute too! Go to BuildingWhat.org. Another big plus is that a generous individual has pledged to match 5% of all contributions made – meaning the more you contribute the more he will contribute! This guest column is by Kevin Ryan, a member of the 9/11 Working Group of Bloomington. Over the past three years, a group of concerned Bloomington citizens has worked to raise the public consciousness about the need for 9/11 truth. These folks are sometimes called “conspiracy theorists” because they do not believe the official version of events. Once people get by their initial reactions to 9/11 questioning, however, much can be learned in the process. To begin with, we all understand the definition of a conspiracy to be a secret plan, among two or more people, to commit a crime. Yet when faced with emotionally charged events like 9/11, many of us pretend that the definition of the word has changed. This is the big leagues. AE911Truth is running a series of 30 second spots on Coast to Coast AM with George Noory in the build up to Richard Gage's appearance as a guest on the show July 31st. Remember this will be a truly national spot airing on 500+ stations! A first for 9/11 truth. [There was a spot on Coast to Coast earlier this year, but it only ran in the Los Angeles market]. This is not just a local affiliate of a nationally syndicated show-- this is a nationwide ad that will be heard by nearly a half million people. Thursday is the original spot by Ed Asner, while following versions will be modified to serve as promos for Gage's appearance on the 31st. Left-Leaning Despisers of the 9/11 Truth Movement: Do You Really Believe in Miracles? According to several left-leaning critics of the 9/11 Truth Movement, some of its central claims, especially about the destruction of the World Trade Center, show its members to be scientifically challenged. In the opinion of some of these critics, moreover, claims made by members of this movement are sometimes unscientific in the strongest possible sense, implying an acceptance of magic and miracles. A very well-worded Letter to the Editor was published in the North County Times (San Diego) this AM. Dwain Deets is a former NASA Engineering Executive and AE911Truth active member. 1. No plane struck the 47-story World Trade Center skyscraper (Building 7). 3. Sudden free-fall drop of eight stories is finally officially acknowledged. Yet the National Institute of Standards and Technology's lead investigator explained months earlier that free fall could not have occurred because that would have meant there would have been no structural components below.